The Gulf of Maine Council on the Marine Environment has over the years recognized efforts by individuals, groups or organizations that seek to protect, enhance and restore the ecosystem of the Gulf of Maine region and safeguard and improve the wellbeing of the communities that depend on its resources. The Council has established awards to bestow on individuals and organizations for their exemplary work as stewards of the ocean. Each year the Council accepts nominations for the awards which include: Visionary awards, the Sustainable Community awards, the Industry award, the Art Longard award, and the Susan Snow-Cotter award. A description of each award along with nomination forms can be found below. 2019 awards will be presented at a special ceremony on the evening of July 10, 2019 in Halifax, Nova Scotia. Nominations for 2019 awards must be submitted by Friday, April 5, 2019. Up to two individuals, businesses, or organizations within each state and province bordering the Gulf of Maine will be selected to receive Visionary Awards (paid professionals or volunteers are eligible). The awards recognize innovation, creativity, and commitment to protecting the marine environment. Recipients may work in the fields of environmental science, education, conservation or policy. They may be engaged in projects that involve public awareness, grassroots action, or business/manufacturing practices. 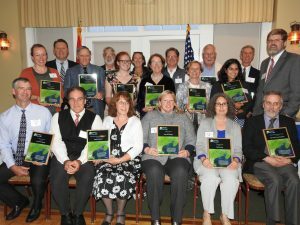 Each year, the Gulf of Maine Council recognizes a community, or group within a community, for exemplary work in achieving sustainability outcomes related to the environment and economy, that are in line with the objectives of the Council’s Action Plan. The Gulf of Maine Industry Award is made annually to one individual, company, or organization within the Gulf of Maine region (Massachusetts, New Hampshire, Maine, New Brunswick, and Nova Scotia). The Award recognizes demonstrated innovation and leadership in efforts to improve the well-being of the Gulf of Maine ecosystem and the communities that call it home. Nominations are sought from the following sectors: tourism; fisheries (commercial and recreational); aquaculture (finfish and shellfish); renewable energy generation (tidal, wave and wind) and; transportation (shipping, ferries, etc.). The Council presents this annual award to an outstanding volunteer within the Gulf watershed who has made significant contributions to conserving or managing the Gulf’s resources. Past recipients have been involved in stewardship projects, educational programs, volunteer monitoring and scientific research. The award is named in memory of Art Longard, a Nova Scotia resident and devoted conservationist who helped to conceive and launch the Gulf of Maine Council. The Susan Snow-Cotter Leadership Award is bestowed in memory of Susan Snow-Cotter, a long-time friend of the Council and Working Group. The Award is given to an individual from one of the five states and provinces bordering the Gulf of Maine. The Susan Snow-Cotter Leadership Award honors those coastal management professionals who exemplify outstanding leadership or exceptional mentoring in the Gulf of Maine watershed. As former Director of the Massachusetts Office of Coastal Zone Management, Susan was recognized as a leader who exhibited unwavering passion, enthusiasm, and insight to develop pragmatic approaches to coastal management challenges. Congratulations to the Gulf of Maine Council’s 2018 award winners.